Does Color Make a Difference For Limousines? Does Color Make a Difference For Limousines? The physical appearance of a limo might not be something you think about when finding a good choice for your business needs. Even with this, it could make more of a difference than you might expect. The colors that you’ll find around a limousine are important to the overall experience. A limo is clearly designed to be a distinguished and refined type of vehicle. Your clients will want to be transported in only the finest and more luxurious limo. The inside and outside colors on the limo will especially create a good mood on the inside. A limo can be bright on the inside to create a festive atmosphere. It can also come with darker lighting and tones all around the inside to establish an intimate feeling. Even the wheels should be checked to see if their colors are bright and intense enough to create a beautiful style all around the outside part of the limo. Regardless of the particular color that you have inside or outside your limo, you will have to look well at how the color on your limo is organized. Let’s look at a few particulars that come with your limo’s colors. How Intense Is the Outside Color? The outside color on your limo needs to have a striking appearance that makes it stand out. It is clear that your limo will come with either a black or white color, what with these two being the most popular options to have. The black or white color will come with a striking appearance. It mixes in well with the darker tinted windows on the top. The white may come with a good contrast over the darker windows. A black tone may also be used to create a consistent look. Either option will offer a good and outstanding look that you are bound to enjoy sporting when picking up people from any place. You don’t always have to stick with a solid black or white color for a limo. Some limo models may come with a mix of black and white colors. These typically entail the top or bottom half of the vehicle being painted in a color that is different from what’s on the other half. In other instances the front half will come with different color accents on certain parts. There are also times when colors other than white or black may be used. These great colors are often offered with promotional purposes in mind. These include vehicles with some nice silver or red tones. 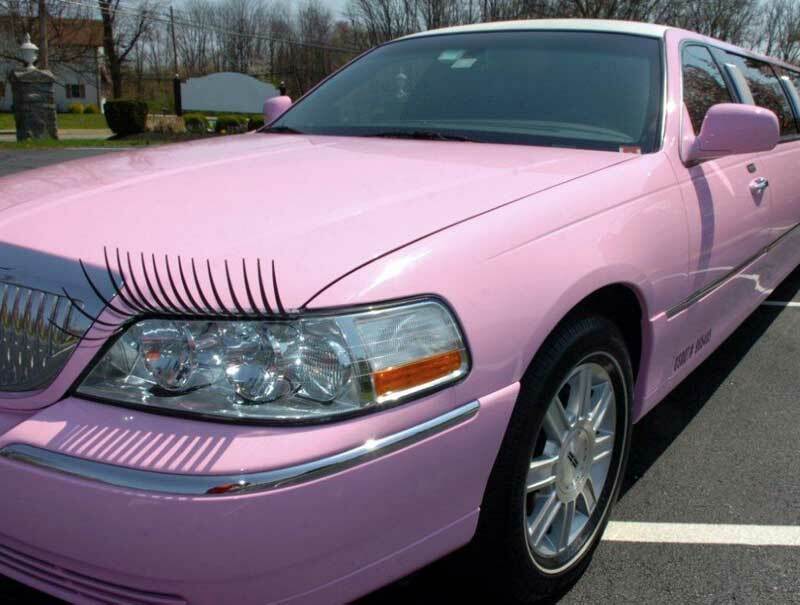 Pink has especially become a popular color for some limos although that color is generally for limos reserved for more festive events. The alternatives that you have to a solid black or white color for your limo are not all that commonplace. Still, it is a great idea to at least look and see what options are available for your desires. Be advised though that it might cost more to maintain a good paint job if it is more intricate in its design or it has an uncommon color. The cost to get a car’s paint job fixed and buffed can be rather high. This will especially be high when the large body of a limo is considered. The wheels on your limo are often very large in size. You might find wheels that are at least 18 inches in diameter. These will be even larger if you’ve got a big SUV limo or even a party bus. The wheels will make an impact on the appearance of your limo. These wheels should be made with great chrome or silver colors. These will blend in well with a black or white color. More importantly, the color should create a shiny look to the wheels. A chrome color is popular for how it reflects light quite well. This makes the vehicle more noticeable. It also draws more attention to the intense appearance on the wheels if applicable. You will need to watch for how well the wheels are maintained though. The wheels need to be properly cleaned and polished regularly to allow the natural colors on your wheels to stay intact. This is especially so you will not be as likely to need an added coat of paint or other finish on your wheels. The seating on the inside of a limo typically features a nice leather surface. This is popular for not only being soft and smooth but also for being available in a good variety of colors. In fact, these colors may be mixed to come with a good variety of tones all over. These colors on in the inside of your limo will typically come with a great variety of black and tan tones. These are both popular colors for the inside of the limo because they offer comfortable tones that mix in well with the walls of your limo. These colors should also blend in well with the glass materials for the windows and the bar and entertainment features here. In many cases the color on the seats will be consistent with just one tone. In other cases a mix of black and tan tones can be included. These include spaces where the tan color will be in the middle part of the seat. The black color is typically found on the outside border of the seat above all other spaces. This is organized in such a way to create a frame. This makes the seating area a little more distinguished with a more noticeable look. This adds a great look when chosen properly. The arrangement of colors should be consistent around all the seats on the inside of the limo. This creates a beautiful tone that adds to the fine quality that comes with such a nice limo design. The lights will be a little more versatile when it comes to colors. Lights in limos are often made with LEDs. These special lights are known for being bright while still using less energy. They also last much longer than other traditional lights. One highly important point about LEDs is that they can change color. They use red, blue and green pigment spots on each bulb. These three spots will change in intensity to create a variety of color combinations. When paired and linked together, these will create all kinds of beautiful colors. This in turn establishes a strong look that you are bound to love having inside your limo. These lights can be programmed by a control panel on the inside of your vehicle. You can use this with a remote depending on the model you have. This allows you to adjust the intensity of the lights and their colors. You could even set up a special color scheme where the colors will automatically change every once in a while. No matter what you choose for your lights, you will certainly find something that looks outstanding and offers a better total look when you check around and see how the lights work. Finding a good LED setup will make a real difference for your vehicle. This will add a great color effect in its own way. In fact, these lights can be strung around your limo in many ways. A star lighting effect may work on the ceiling. A disco floor effect may be added too. Sometimes a bar that extends along the sides of your limo interior may also be used. Either way, the lights you have should be designed with beautiful tones that can change colors as needed. Of course, the ability to dim the lights helps too. This allows the color to be as intense or muted as desired. Can You Program the TV? The television set inside your limo may also be programmed to offer a nice screensaver-like appearance. That is, it can work with a display setup that shows a series of changing colors and artistic patterns. A good television set in your limo can be linked up to a DVD player that will play back relaxing visual scenes that feature different colors that will change periodically. This is great for atmospheric purposes but it is especially useful for business clients who just want to relax and feel calm after a tough day. This works better if you have a larger television set to work with. This is great if your set is about 30 or 40 inches in size. Naturally, it might have to be added into the privacy divider to make it work. This should at least create a good look that you’re bound to like having. Don’t ever think that the colors on your limo don’t make much of a difference. They will directly influence the overall feeling that comes with having a fine limo. Your limo needs to be made with a design that you are bound to enjoy having. Anything that stands out and gives you a quality look is always a plus to think about. Check all the parts of your limo to see if it’s got a design that you like. Anything that looks beautiful or at least sticks out from the crowd is always worthwhile. The color will have to be reviewed well to see that you have something that you’ll love driving around. This can make a real difference if you at least think carefully about how it’s going to work and what you are bound to get out of it.